A NEW HOUSING scheme that will house 23 Galway families will be launched today. Costing €3.8 million, the scheme at Maigh Rua in Doughiska was developed under a joint initiative between Co-operative Housing Ireland (CHI) and Galway City Council. Co-operative Housing Ireland (CHI) is the national organisation for co-operative housing. It is the first development delivered by CHI in the west Ireland, following the appointment of a development manager for the region in 2016. CHI says a further 90 housing units are under development in Galway City and more than 200 additional homes are planned for the wider region over the coming 12 -18 months. The Maigh Rua scheme comprises 23 apartments adjacent to the local quality bus corridor. It comprises one, two and three-bedroom apartments and townhouses. Many of the units are dual aspect with private balconies. Each apartment has its own individual self-contained external storage space accessed off the car park. Development began on the site in 2008, but it remained unfinished until this latest scheme. Funding for the scheme, on the site of what was a previously dormant development, is a result of collaborative support between Galway City Council, the Housing Finance Agency, and Department for Housing, Planning, Community, and Local Government. Families moving into the scheme are drawn from the Galway City Council housing list and some of the households are coming from homelessness or overcrowded accommodation. Residents will become shareholding members of a local co-operative society. 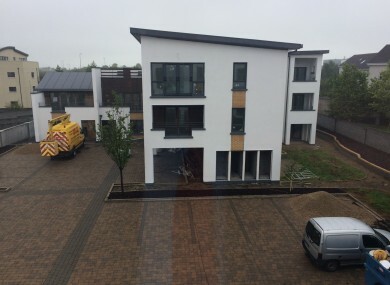 Email “A €3.8 million co-operative housing scheme built on former ghost estate opens in Galway today”. Feedback on “A €3.8 million co-operative housing scheme built on former ghost estate opens in Galway today”.